From the beginning of recorded history, societies have honored those who die with a ceremony. In the beginning, the purpose of the ritual was to send the deceased on his or her journey into the afterlife. Today, however, many experts agree that the benefits of a service are for those who remain behind. A “closure” of sorts must occur to help survivors adjust to their loss and recognize that a death has occurred. A funeral service provides the opportunity for friends and family to celebrate the life that was lived and allows the healing process to begin. Funeral costs vary depending on the funeral home and type of services and merchandise selected. There are two types of costs associated with a funeral: (1) services provided by the funeral home and (2) merchandise such as a casket or urn. Some types of services require more or less involvement of our professional staff and facilities than others and are priced accordingly. We pride ourselves on our ability to help every family create a meaningful tribute and lasting memorial for their loved one in any price range. Call or visit our funeral home to discuss your needs and to receive a general price list that will give you full details. And remember, if choosing burial or interment, you may need to purchase cemetery or mausoleum space as well as some type of memorial. Those arrangements are sometimes made separately with a cemetery. What methods may I use to pay for the funeral? Funeral costs may be paid by cash, check, VISA, MasterCard, or an assignment of verified insurance benefits. Many families choose payment plans available through preplanning. This important decision can limit or eliminate the financial burden when the death of a loved one occurs. Yes, preplanning a funeral is one of the most caring things you can do for your family. Preplanning provides a clear picture of your final wishes and relieves your family from having to worry about how you would prefer to be remembered. These plans may be as simple or as elaborate as you choose — and keep in mind that making personal and meaningful plans does not have to mean added expense. You can comfortably prefund your arrangements to alleviate placing future financial burdens on your family. The preplanning process allows you to plan at your own pace, equipped with facts and ample information, so that you feel comfortable and secure about the choices you make. Making arrangements in advance also guarantees a service and funeral at today’s prices, free from inflation. We can assist you with your prearrangement needs. Caskets are made of either metal (bronze, copper or steel), wood, or composite materials and are available in a variety of styles and colors. Prices vary, depending on the exterior and interior materials used. Bronze, a semi-precious metal, is more expensive than steel. Mahogany, a rare hardwood, is more expensive than the readily available softwood pine. There is also the option of adding personal touches to most caskets with customized embroidery and corner pieces for the casket. Embalming is the temporary preservation of a person’s remains using a chemical process. This procedure allows family and friends an opportunity to say their good-byes. Embalming is not required by Maryland State law, though funeral homes are given discretion to require it when a public viewing is planned as part of the service and Rausch Funeral Home requires embalming in these circumstances. Yes. In fact, our staff is trained to complete all necessary paperwork to begin the benefits process and will follow through to ensure that the benefits are secured in a timely manner. What has to be done when a death occurs in one location or area and the funeral service will be held in another? If our loved one is being transferred to another city for a funeral service and burial, can we also gather family and friends for a local service? Yes. Rausch Funeral Home will work with you to organize a time and place either before or after the transfer for family and friends to gather to celebrate special memories of the decedent and to support each other during the time of loss. What has to be done when a family member dies while on a trip out of town? 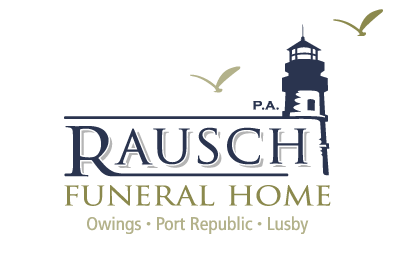 When a family member dies while out of town, contact Rausch Funeral Home. We will assist you by working with an out-of-town funeral director, who will handle all the necessary details in the distant city, state or country. Working together, we will gather all the necessary information to allow for the transfer of your loved one back home.